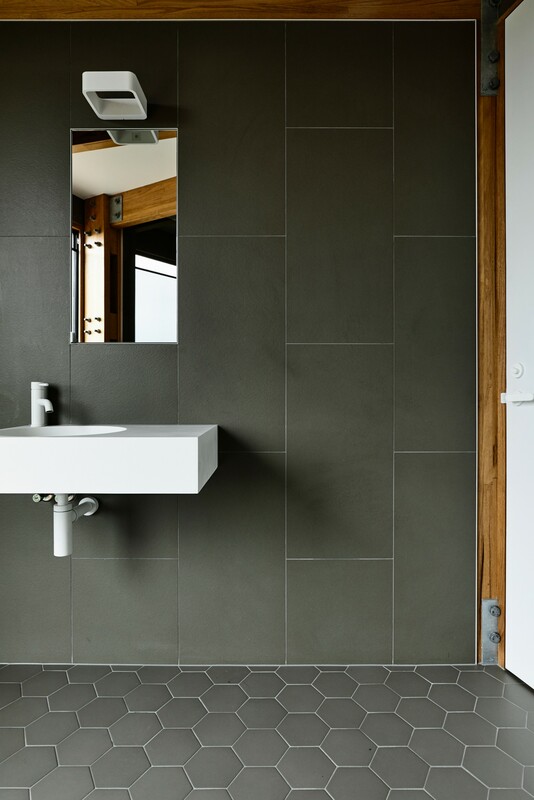 Austin Maynard Architects’ House on the Beach in St Andrews, in the Australian state of Victoria, offers an opportunity to talk about the relationship between architect and client today. An enlightened client in Australia looked for an architectural studio to conduct an experiment in minimal beach living. Floornature has already published articles on several high-impact residential projects by the studio in question, Austin Maynard Architects, such as That House and King Bill in Melbourne. The architects are known for an approach to design demonstrating a particular awareness of the need to reduce the exploitation of land and natural resources. The beach in question is the famous St Andrews Beach, on the Mornington Peninsula in the state of Victoria, on an almost completely wild stretch of coast south of Melbourne that has in recent years seen construction of wealthy homes on private land extending right down to the waterfront. With plenty of land available, the newer beach houses have started to look like city houses; there appears to be a fashion among wealthy Australians for moving to the beach while still demanding all the comforts of an upper-middle-class home in the centre of Melbourne. But, in response to their client’s request, Mark Austin and Andrew Maynard attempted to find the right balance between the idea of the home and that of the shelter, between the temptation to multiply the amount of space and number of rooms and the obligation to fit the home into its natural surroundings with only minimal impact on land and vegetation. The client expressly asked them to design a “bach”, a term used in New Zealand to refer to a hut, a very modest home or cabin, a sort of improvised shelter. A number of these were constructed on Australia’s long beaches in the middle of the last century, mainly out of found and recycled materials, without claiming to offer any more than a roof and a little shelter. 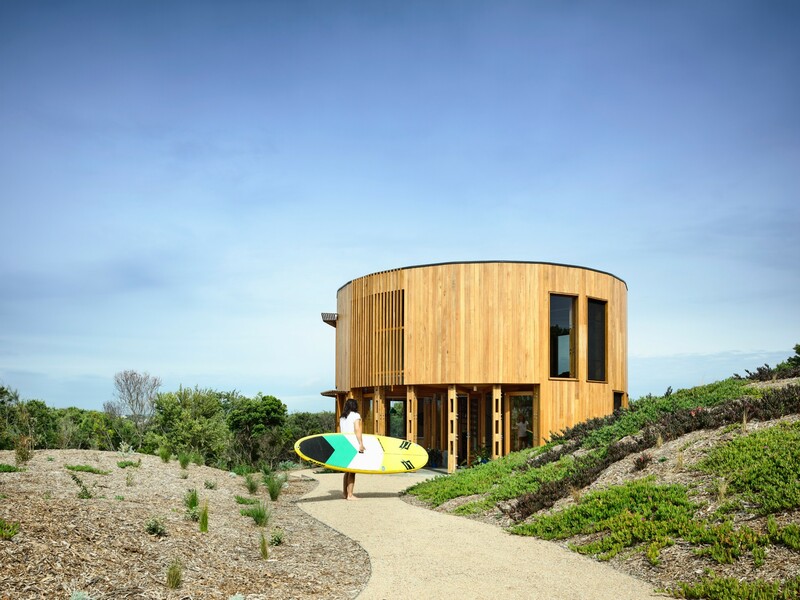 The architects started out by thinking about what a beach house means to Australians: a place they can easily get to from Melbourne to spend a weekend or a short holiday with family or friends; a “minimal” shelter requiring only minimal maintenance. Simple structural technology and basic comforts were the principles underlying its design. The architects immediately excluded the idea of building an underground garage because of the economic impact of the excavations this would require. They considered it preferable to create a sort of “portal” for accessing the site, beyond which visitors would have to continue on foot, leaving their cars by the sandy path. This “gate” is symbolised by a big concrete tank for collecting rainwater for use in the toilets and watering the garden. To reconcile the idea of minimal impact on the landscape and protection of the existing wild shrubbery with the need to create a space capable of hosting several people, the studio constructed the building on a small space, but on two levels, 78 square metres on the ground floor and 61 square metres on the first floor, with a rooftop terrace. Three accessible levels, with open floor plans with very few partition walls, just sliding glass doors and curtains to separate the space as required. The most convenient shape for doing this was a circle: the house is a perfect cylindrical volume with a radius of only 5 metres on the ground. Toward the end of the sixteenth century Italian architect Andrea Palladio built a villa with an unusual floorplan. His unprecedented project, Villa Capra, better known as La Rotonda, located near Vicenza, has a square floor plan with a round central hall topped by a dome and loggias on all four sides. The plan is believed to have been dictated by the site: a low hill on one side, with the town of Vicenza, the plains and Mt. Berico on the other. Nature was its theatre, and Palladio made use of it with a building that had splendid views on all sides. Palladio’s intuition seems to be echoed in every building with a total view over its natural surroundings. 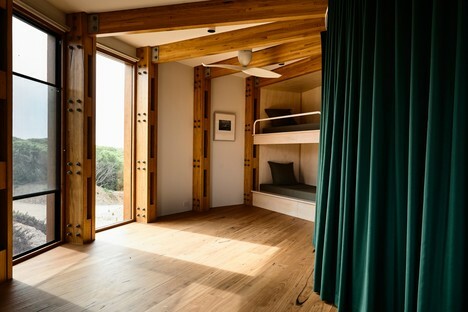 Here too, in the shelter on St Andrews Beach, the designers seek to eliminate as many built barriers between the house and nature as possible. With no single dominant orientation, the house does not have a front, back and sides; every side is equally important, and must be preserved. The structure is made of completely exposed glulam covered with boards, with plenty of windows and doors. The wood will age naturally without losing any of its strength. The appearance of a “big object”, rather than a small building, creates a sense of lightness. Inside, the circular floor plan reflects the desire to eliminate the corridor, a banal connection between rooms which seemed like an underused space. In this circular floor plan, all the rooms open onto one another, with no fixed dividing walls, and a spiral staircase in the middle provides a vertical link without taking up a lot of space. The open, light-filled stairwell amplifies the depth of the little rooms and provides visual links between them. From the perimeter to the centre, the floor space is divided into wedges, allocating different functions (kitchen, living and dining room, bathroom and laundry room) which are minimal but sufficient in terms of space and fittings. The upper level is entirely left open, except for the bathroom, and sleeping places can be arranged as desired. The foyer is an interesting detail; a feature much in vogue in holiday homes of this type is a little terrace that extends the living space outdoors, which however produces a residual space of low quality, in the shade. This project brings this feature inside the volume of the home, creating a covered open space as tall as the building itself, forming the entrance and the boundary between inside and outside.